Active Ankle Rated to 250 Lbs./Swim Ankle Rated to 350Lbs. Rampro recommends a hollow exoskeletal leg with a Kingsley Steplite foot. The exoskeletal allows the water to flow undisturbed along the length of the leg and onto the foot. A foam covered endoskeletal leg has a tendency to absorb water and even if the foam is waterproofed creates too much positive buoyancy. By drilling two holes in the hollow section of the exoskeletal leg and allowing water to fill this cavity, eliminating excess positive buoyancy. 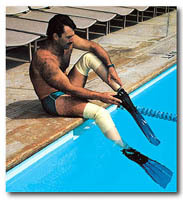 When a foam-covered foot is attached to the hollow exoskeletal swim leg, ideal positive buoyancy is attained. A Steplite foot is another major factor for increasing hydrodynamic efficiency. When the Activankle is bolted to a Steplite foot, the Activankle pivots from a point closely resembling the natural ankle joint. When these two are attached to the exoskeletal leg and fully plantar flexed, the top of the Steplite foot will line up evenly with the anterior of the leg. Water flowing undisturbed along the leg and directly onto the top surface of the foot is what allows the foot to generate power. Suspension is very important. In the water, the prosthesis should feel as if it were bearing weight. If the limb is not suspended correctly, each kick will allow the residual limb to wobble inside of the socket, creating friction, and energy will not be fully transferred to the foot. Silicone, urethane and latex suspension sleeves, work very well. They also keep water out. The addition of an auto expulsion valve creates superior suspension. For use with a pin suspension liner such as Alps or Silipos Liners, use Fillauer's Gator Grip Lock. Whether you build endoskeletal or exoskeletal, the components used should be waterproof and corrosion resistant to salt. Kingsley's Steplite is Rampro's choice of foot. Water will not damage this foot. It has a graphite keel, the foam does not absorb water, and it can be ordered in several heel heights including flat. A KC10T Steplite Wayfarer is ideal for use around the water where barefoot is usually the norm. For added durablility, use an aqua shoe with no heel such as Nike's "Reefwalker" to protect the prosthetic foot and the real foot. When fabricating a hollow exoskeletal, laminate a pyramid into the distal end of the leg. If the leg will also be used for snow skiing a low profile rotatable pyramid adapter should be used. Snow skiing typically requires the foot to be toed out 4 to 8 degrees. This document contains general information about the Kingsley Steplite line.